As I write this post, I’m sitting in sunny and HOT Puerto Escondido, Mexico. When I head back to Virginia soon, I know I’ll be in for a shock because back home winter is nearly here! 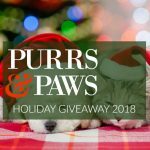 To help adjust to the much much colder weather and to just get into the holiday spirit, I’m partnering with 9 of my favorite pet blogs to offer you a chance at winning one of three amazing prizes. When I say amazing, I mean A-MAZ-ING. 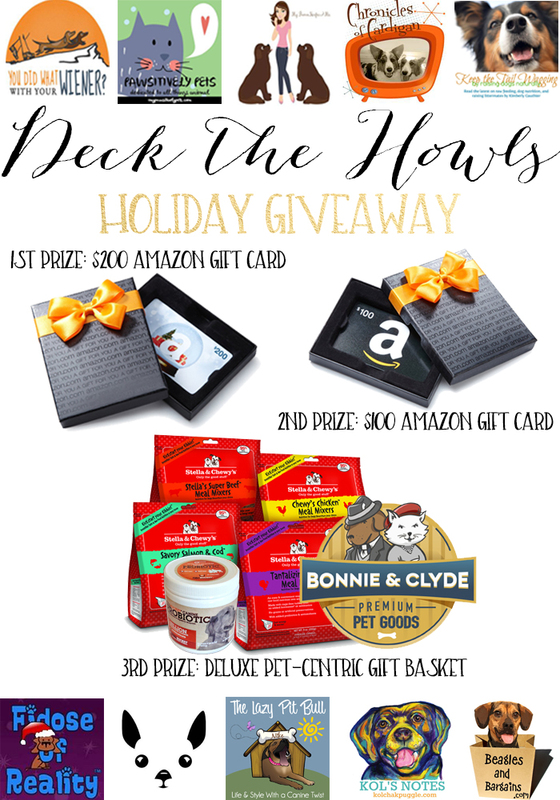 These fantastic prizes could surely help cross a few loved ones and furry friends off your holiday shopping list. If you are doing any shopping today (Black Friday), later this weekend, or Cyber Monday be sure to check out my round up of Black Friday Deals for Pet Lovers to make sure you get the best savings! Any dog would be lucky to receive our Pawesome Pet Prize Pack. And let’s not talk about what $100 or $200 to Amazon could buy. I know it would help make a big dent in my holiday shopping. 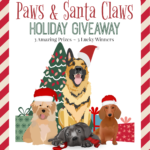 Since I can’t enter to win these amazing prizes, my paws are crossed for you! Great question! First, check out the Rafflecopter at the bottom of this post. Enter it just like you would any other Beagles & Bargains giveaway. There is one mandatory entry and whole bunch of optional entries that follow. Enter as many as you can for more chances at winning. BUT WAIT. It doesn’t end there. 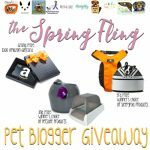 As I mentioned, I’ve partnered with 9 other amazing pet blogs to host this giveaway. That means you can increase your chances of winning by entering on all 10 participating blogs. That’s 10 chances to win big! So what are you waiting for? Enter below. 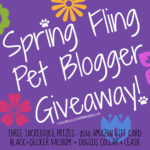 Then hop on over to the fantastic pet blogs listed below and enter to win again on their blogs! Be sure to keep hopping until you have hit all 10! This giveaway ends at 11:59 PM ET on Thursday, December 3, 2015 and is open to US and Canadian residents (excluding Quebec). Three winners will be randomly selected on Monday morning and announced on Beagles & Bargains Facebook page (be sure to follow, so you don’t miss out)! The winners will be notified via email and each will have 48 hours to respond and claim his or her prize. This is just the first of many Holiday giveaways here at Beagles & Bargains. Stocking Stuffer Giveaways are coming back starting December 1, 2015. 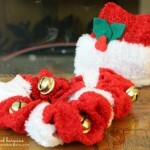 So keep checking back for more ways to win amazing prizes to keep your pet’s stocking full this Christmas. No purchase necessary. Giveaway is open to US and Canadian residents only, except where prohibited by law. Giveaway will run from November 27 through December 3, 2015 at 11:59pm ET. This website will randomly select one “finalist” whose name will be added to a drawing including “finalists” from the other 9 participating websites. From there, three (3) winners will be randomly selected and notified via email. Odds of winning depend on the total number of entries received. Once notified, winners will have 48 hours to claim their prizes; failure to do so will result in forfeiture of the prize. Facebook, Twitter, Pinterest, and Instagram do not sponsor, administer, or endorse this promotion. Each participating blogger paid an entry fee that will be used to fund the gift card prizes. The items in the 3rd place prize package were donated by the participating brands.